An Eclipse carnival was hosted in Bangalore on 17th and 18th of July, 2009. The organizers of the hugely successful Great Indian Developer Summit, the Salt March Media and the Eclipse based consulting firm ANCIT Consulting have joined hands together to create two days of Eclipsing - The Eclipse Summit India, 2009. Its exciting to be surrounded by Eclipse hips and hops, bells and rings, yums and yummies for two days - technical presentations, get togethers, contests, evangelism etcetera. For the last two years ANCIT consulting conduct the Eclipse Demo Camps in Bangalore. The demo camps have nurtured and patted my interest in Eclipse and has created atleast one more eclipse enthusiast. On day 1, at 9 in the morning, I stepped into a hall full of eclipsers. I guess, around 300 people were filled in that hall. Instead of the first session, I would like to comment on the last session taken today, not because I have short term memory loss as in Memento, but because it was the most enthusiastic presentation of the day. The topic was EMF, and it was taken by the young charismatic Chetan Kumar, the author of the blog Eclipse Fever and Annamalai Chokalingam, CEO of ANCIT Consulting. The 3 hour session started with the need for modelling in software applications, popped from the basics to the advanced EMF areas like code generation, emf queries, emf transactions, dynamic emf, teneo etc. For EMF doubts may be you can contact Chetan at "chetankumar at gmail dot com" and Annamalai at "training at ancitconsulting dot com". Thats all about the last session; now coming back to the morning sessions, guess who did the keynote for the opening talk of Eclipse India Summit 09. The keynote opening talk was made by the Director, MTC, Microsoft - Mr. Ramkumar Kothandaraman. Quite surprissing to see Microsoft presenter opening an opensource get together. Microsoft has a success story on apps that run on individual machines - like Windows OS, MS Office Suite etc. But the future will be on apps that can talk with other systems with ease. MS wants their systems to talk with other systems. Hence, they want to learn more about open systems, and the best place to look for open systems is the open source. MS will be looking to make a mark on standards that define how the systems should talk with each other. Mr. Ramkumar touched on topics like PHP support on windows applications; Azure, the cloud platform; Eclipse tools for Silver Light - the Eclipse4SL; Java API for OpenXML, Poi for Apache. After the keynote talk, the actual presentations started on three different rooms; it was difficult to choose which talk to attend as all of them seemed too good to miss. The first talk was from Mr. Illya Shinkarenko. He is a self employed software architect based in Germany (Eclipse Training Alliance). He started with the architecture of a sample RCP application and quickly drifted to the advanced stuff, but explained in a simple manner. In the other rooms Annamalai Chokalingam (ANCIT Consulting) and Lavanya Konda took a 3 hour session on GEF and Zest, which covered some of the advanced techniques and in-depth look into the graphical frameworks; The other talks were by Shaun Smith on Eclipse Link, Sunil Bannur and Mayank Kumar on Adobe Flex Builder. Adobe Flash Catalyst is a new interaction design tool to rapidly create user interfaces without coding. Prakash GR from the Eclipse Platform UI team and author of Eclipse Tips blog, presented the topic 'Patterns in Eclipse'. It was quite a useful session for the plugin developers; a few tips and tricks were added bonus to the audience. After lunch, Ankur Sharma, the Eclipse Platform team member and author of the blog Eclipse PDE briefed on various aspects of the target platform management in Eclipse. He talked about multiple target management, API tooling etc. Mahesh Shankaran had taken a design case study of a GEF based application with lot of advanced UI features. 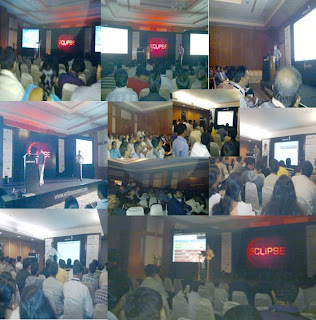 Salt March Media and ANCIT Consulting has done a good job with organizing such a successful event for the eclipse developers in Bangalore.